Connectivism and Connective Knowledge (CCK09) in 2009 was the first MOOC I think I participated in, although I may have dipped in and out of the inaugural one a year prior. I certainly remember more about Personal Learning Environments, Networks, and Knowledge (PLENK2010) run the next year. That MOOC, facilitated by George Siemens, Stephen Downes, Dave Cormier, and Rita Kop, and others they ran were organized similarly. The course had a website hosting a sign-up facility, a syllabus and general course information, links to the online presentation rooms, and usually forums. Students were encouraged to explore a given topic space, aggregating resources. They were aided by the facilitators who produced some appropriate content and either gave a presentation each week or invited someone else from the educational technology community to do so. From these resources and influenced by content contributed by other course participants, students would produce their own content in the form of blogs, movies, mindmaps, etc. These would be shared with other participants and there was an ethos that encouraged remixing or repurposing content. Each day, a newsletter would be mailed out to participants, highlighting some of the recently produced artifacts. You could also search around the web for the #PLENK2010 hashtag or subscribe to an RSS feed of participant blog posts. It was many-to-many. PLENK2010 was completely unlike the Coursera offering. The Gamification course had the following elements: a course site with the latest news, a syllabus, the course lectures, multiple choice quizzes, written homework assignments, and the forums. The course content consisted of 12 units, with each unit containing five or six 8-to–15-minute videos. A few videos were interviews with other people, but the majority were Kevin Werbach addressing key concepts. It was a structure that encouraged passive consumption. That’s not to say students weren’t encouraged to work with the material. Some videos contained one or two simple multiple choice questions embedded within them and many contained “reflection exercises” where the watcher was asked to think about something, write down a response, and then share it later in the forums. The forums also provided space to arrange meetups and local study groups. Certainly the Twitter #gamification12 tag saw some good use. Some students did write blog posts and others contributed to a wiki or to preparing and sharing video annotations. However, for the majority of students, the only content production would have been forum posts, the written assignments, or peer feedback. With this type of structure, very early on I found myself musing how Coursera was any different to the Open University, for whom I’ve taught online since 2001, or any other higher education institution with course content online. Coursera basically appeared to be an LMS or VLE. Sure, it operated on a large scale per course, even larger than that of the Open University, but still a VLE. Sui Fai John Mak is a regular contributor to the connectivist MOOCs I’ve previously joined and a collaborator on some peer-reviewed papers around MOOCs and a pedagogy of abundance. In a recent blog post, he described MOOCs in this style as “flipped classrooms”, but ones still based on the instructivist approach. The “flipped” part, explained earlier in the post, is that the “classroom” is used for the interactive parts, while the content and some exercises are completed by the students at home. It’s still, however, basically the traditional approach to learning. It is the classic “sage on the stage” approach (King 1993)King:1993 but one-to-very-many. @laurapasquini @gsiemens Coursera et al latched on to the “open” (read: free) & “massive” parts but not the connectionism/rhizome parts. @laurapasquini Coursera IMO is not any different than the Open University in terms of how and how many. Neither a @gsiemens MOOC. 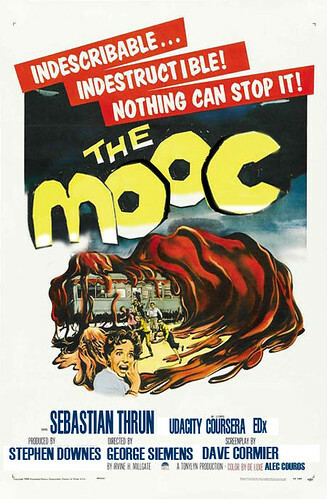 On Twitter I was commenting on how we’d need a different term to differentiate between the (for me) “traditional” connectivist-based MOOC and the new MOOCs by Udacity, Coursera, and similar. Nobody embarrassed me by pointing out that it had been done while I’d been on an extended vacation earlier this year. We now have “xMOOC” to describe the Coursera-type offerings and “cMOOC” for the connectivism-inspired approaches. George Siemens (2012)Siemens:2012 succinctly defines the difference as “… cMOOCs focus on knowledge creation and generation whereas xMOOCs focus on knowledge duplication. ” or pithily as @MarkSmither’s other half put it: “in an xMOOC you watch videos, in a cMOOC you make videos.” So true! Despite their pedagogical differences, the two approaches share some characteristics, not all of which can be seen as good. In a follow-up post, I’ll consider the practical issues of courses with tens of thousands of students as experienced as a participant in the Gamification xMOOC, contrasting them with some of the issues as I perceived them for participants in cMOOCs. Mak, S.F.J. (2012) ‘In MOOCs, more is less, and less is more (part 2)’, Learner Weblog: Education and Learning weblog, blog entry posted September 12. Available at: http://suifaijohnmak.wordpress.com/2012/09/12/in-moocs-more-is-less-and-less-is-more-part–2 (Accessed October 19, 2012). King, A. (1993) ‘From sage on the stage to guide on the side’. College Teaching, 41 (1), pp:30–35. Available from: http://www.jstor.org/pss/27558571. Siemens, G. (2012) ‘MOOCs are really a platform’, Elearnspace: Learning, Networks, Knowledge, Technology, Community, blog entry posted July 25. Available at: http://www.elearnspace.org/blog/2012/07/25/moocs-are-really-a-platform/ (Accessed October 19, 2012). Giulia and Michelle. I, too, am eager to see the learner’s perspective — not to mention the learner’s needs — as part of the experience more. I’d love to talk with you more about a project I’m working on (without spamming up your comments section). Will you be in touch with me at robert at moocnewsandreviews dot com? I hope to talk more with you soon. I found this post through Flickr image link back. I’m glad you used that Blob remix poster. I just wanted to say I appreciate reading your reflections as a student. I’m getting a bit sick of reading about monetization and business plans from the administrative perspective. It’s refreshing to actually read a learner perspective. cMOOC folks like Sui Fai John Mak are prolific and wonderfully reflective, considering millions are signed up for these xMOOC courses, I would think there’d be more student reflections about them but I’ve not seen that many. I hope you do get a chance to write a bit more about your learning in the course. I read your other post about this course and it’s unfortunate that the coursera videos are locked away, (so much for the Open part of MOOC). Finally, I wonder how you feel about this course, now, a month later. Are there any salient learning moments that seemed to have stuck with you? Thanks for stopping by, Giulia. I have on my (always lengthening) list of things to do to write a follow-up or two to this article. In the second part, I wanted to discuss what aspects both share that I think don’t work very well and why. I also meant to write one about the content of the gamification course and how aspects of the presentation method worked or didn’t work for that. I was really pleasantly surprised how “balanced” the instructor’s approach was. So much of the focus always seems to be on the really easy and extrinsic motivating methods of using points, badges, and leaderboards. cMOOC has nothing to do with the concept called now xMOOC. It should be called just Free ONLINE by elite universities . nobody complained about the quality of teaching and learning . One universğity made $ 1 billion profit in one year with 600,000-700,000 students . Nobody complained . Now elite universities are providing the same education free people started complaining of quality . Pedagogy etc . Where were you sleeping until now for 10 years. Where were you before. ?